When Will I Get My Rip Hangers? 5,000 and under Rip Hangers: Ships or ready for pick up in 2 business days from proof approval. Over 5,000 Rip Hangers: Ships or ready for pick up in 5 business days from proof approval. Rip hangers let you connect with customers right at their door! Select the online rip hanger printing service of 48HourPrint.com and be confident that you’re making a good impression. Enjoy the benefits of our high quality rip hanger printing at very affordable prices. In addition to excellent quality, you get fast delivery with our industry-leading 48 Hour Turnaround Guarantee for quantities of 5,000 or fewer rip hangers. Rip hanger printing delivers marketing messages with takeaway sales tools. Rip hangers -- door-hanging cards with a perforated business card or money-saving coupon -- can really get people’s attention. Rip hangers are perfect for delivering special coupon deals to hotel guests, or canvassing local neighborhoods with marketing messages and detachable coupons or business cards. Rip hanger printing lets you get closer to customers and make sure your marketing messages and special deals get delivered. Preserving the environment is important to 48HourPrint.com. Our rip hangers are printed on recycled cover stock, which delivers excellent rip hanger printing results on stock that is brighter and more uniform in color. Recycled cover stock is our standard stock, at no extra cost to you. 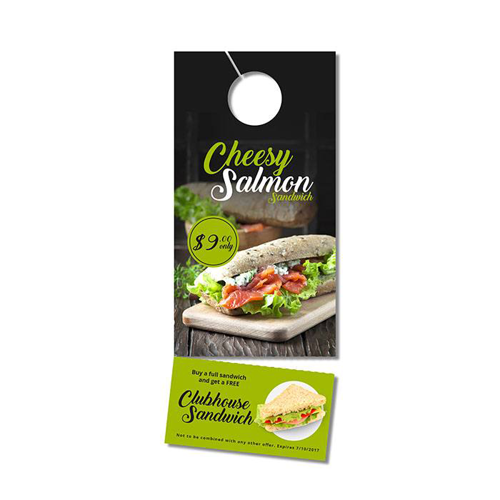 Our two-sided rip hangers are printed in full color on both sides on 14 point cover stock, with your choice of matte coating, gloss coating, high-gloss U.V. coating, or C1S (coating on one side). For promotional tips on using rip hangers, check out our rip hanger marketing ideas. Also review our rip hanger templates for layout guidelines that will help keep your print job on schedule.